RACE REPORT Emotional would be the word when it came to this race. I tend to follow in my dad’s footsteps. 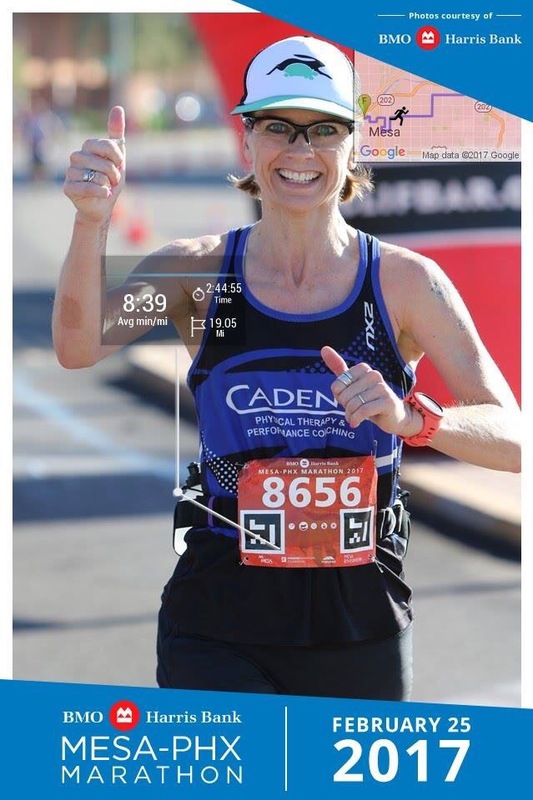 First with speed skating, then road biking, then ultra running. 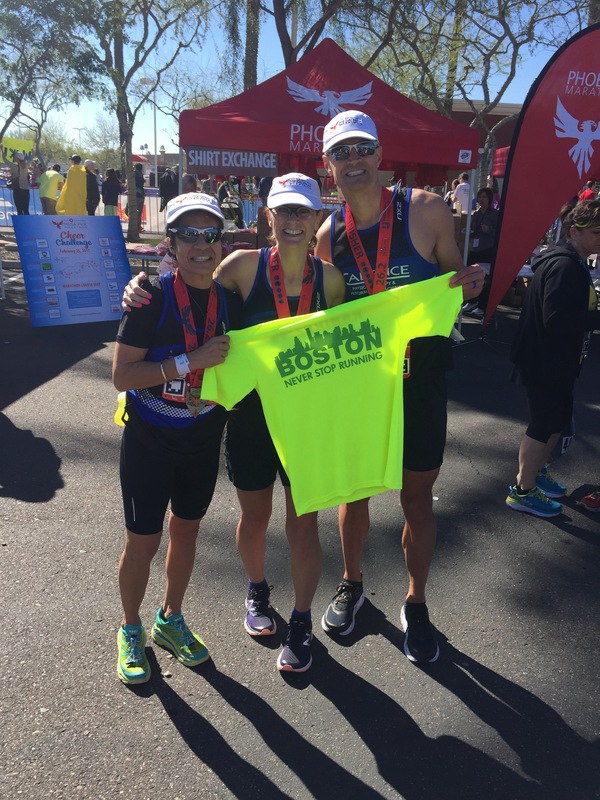 So, on February 25th, my sweet hubby and I ran the Phoenix – Mesa Marathon with hopes of Boston Qualifying. My dad has run the Boston marathon several times. What fun would that be to have his daughter and son-in-law qualify. As I look back, still in disbelief that I’ve qualified for Boston, a few things came to mind. 1. 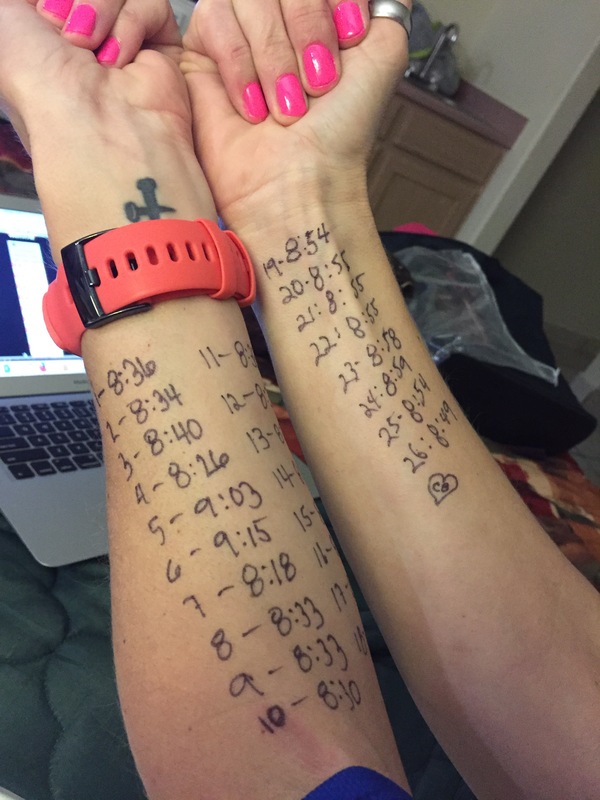 We went to Find my Run and decided to follow those times for a 3:50 finish. I wrote the times on my arms in permanent marker. Man or man did that help. Check out the picture. It’s kinda funny, but it so worked. 2. Putting in the time. Having a coach figure out my workouts. That is KEY for me. Takes the guessing out of things. That way I could just focus on the assigned workouts. 3. Following the plan. Stick to it. This race was FAST in the beginning. I did end up running a bit faster in the first 1/2 than I’d planned. That might have led to my last three miles of suffering (and being about 20 seconds per mile slower than the plan)…but I’d banked enough time, I guess. Thank you Lisa and Pam!! 4. Fuel: For breakfast I had a PBJ, then had a GU gel at the start. I sipped my Tailwind throughout the entire event and had two GU gels, one at mile 13 and then another with three miles to go. (I need a little extra push…I was hurting). 5. Ice Bath After: We stepped into our NOT heated pool…it hurt for a minute or so, but then after, the legs went numb. Overall, the race weather was perfect. Freezing cold in the beginning. But that’s good. I thawed out about five or six miles in. I think it was about 39 or so at start and I wore a tank top, shorts, and gloves, along with my Tortoise and Hare trucker cap. Glad I did. As I approached the last hour of running, I was totally glad I didn’t have any layers. HUGE thanks to Carol & Sean Egan who took care of me at the finish line. I was so emotional, looking for Charlie, and completely overwhelmed with the fact that I’d qualified, I was totally out of it. I usually get pretty emotional after big races and such, but this one, it really was special. 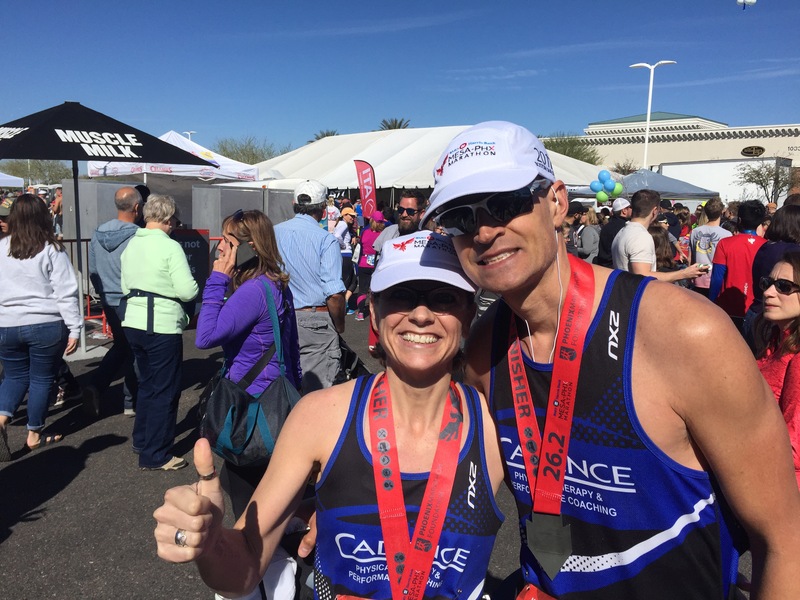 Husband and Wife team qualifies for Boston! Daughter following in Dad’s footsteps. It was an amazing experience to share with my sweet hubby. Since the race I’ve been on the Seymour Agency Winter Cruise where I’ve been relaxing and eating as I hang out with some amazing authors, agents, editors, and movie producers!